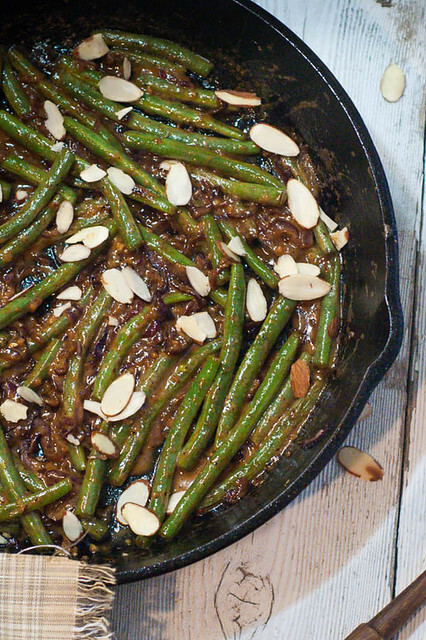 This one pan recipe pairs fresh green beans with a creamy sauce made with caramelized red onions, garlic, cream, and butter. Top it with crunchy sliced almonds. Please. If you do nothing else this week….eat these. Oh. My. Gosh. I set out to make a delicious green bean dish for Thanksgiving that didn’t use the oven. Because that big fat bird is always taking up all my precious oven space. I didn’t realize I was going to make crack green beans. Let’s be honest….green beans get a bad rap. And rightly so! I don’t care to recall how many cans of green beans we ate when I was growing up. I thought I HATED green beans (this is not an unusual story). When I was in high school I tasted fresh green beans at a friend’s house and freaked out. I remember mentally kicking myself for years after that for not getting that recipe from her mom. Fast forward to now….green beans are one of our all time favorite garden crops. I have made a ton of delicious things with them but this is hands down my favorite rendition. And it’s crazy easy and you make it in one pan. That totally makes things taste better right? Also it holds amazingly well in two separate places of the recipe so its totally forgiving when you have a child crisis, or realize you need to take a shower before your guests arrive, or discover that it’s Thanksgiving and you have to run to the store….again. Please tell me I’m not the only one? We start with caramelizing a few red onions sliced super thin in olive oil. A drizzle of honey helps things get going a bit faster. After about 15 minutes (or when you are about ready to shove your entire face into that pan of onions) push them to the edges of the pan and toss in the green beans right in the middle. Another splash of olive oil, a bit of minced garlic and salt and pepper. Let them get nice and crispy in there, stirring occasionally. You can hold here until just before you are ready to serve. When it’s go time crank the heat up, throw in a tablespoon of butter and the cream and get all that crispy goodness mixed into one beautiful brown sauce. Consume. Hellloooo vegetables. I promise you will never feel the same way about green beans after you eat these. 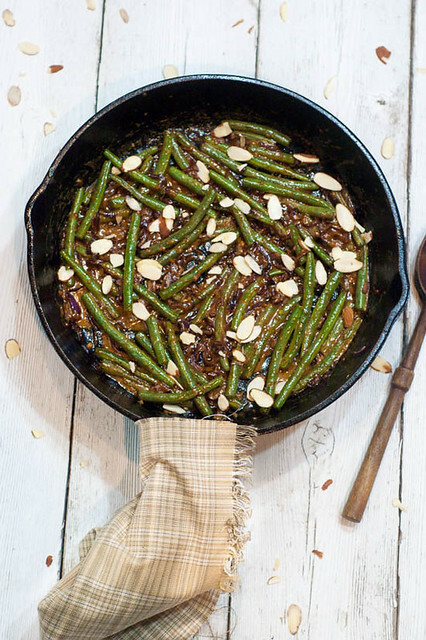 Creamy Stovetop Green Beans-- This one pan recipe pairs fresh green beans with a creamy sauce made with caramelized red onions, garlic, cream, and butter. Top it with crunchy sliced almonds. Add enough olive oil to pan to thinly coat surface. Add red onions and drizzle with honey (I don't usually measure it). Cook for 15-20 minutes on low-medium heat (3-4 on my stovetop) until nicely caramelized and fragrant. Stir 1-2 times. Push onions to edge of pan and add green beans, garlic, salt and pepper and a bit more olive oil if needed. Cook until tender (about 10 minutes for my taste). Can be held here until serving time with no problems. Serving: Add butter and cream and cook on high heat for 2 minutes. Top with sliced almonds. Can be held hot here if needed, but is preferable to serve after adding butter and cream. **Peel the onion and cut the onion in half through the root end. Then slice thinly parallel to the root end so that you get thin half rings of onions. Can be doubled easily. If tripling cook up in batches up until the butter and cream additions, then combine and make sauce. 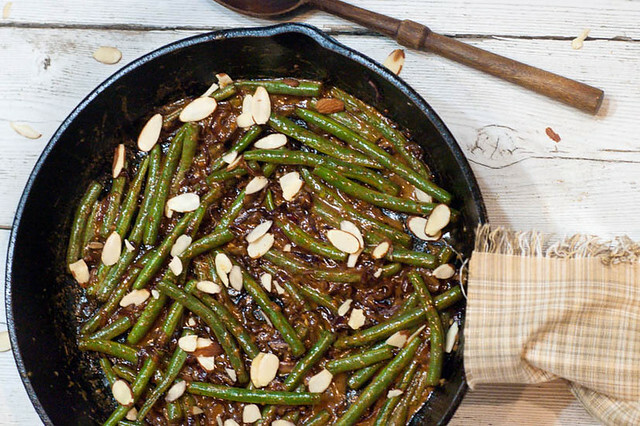 I don’t think I’ve ever had green beans quite like this – sounds absolutely delish!